Hospitalization for any reason can have significant effects on a patient's functional ability and often results in the need for post-acute therapy services. 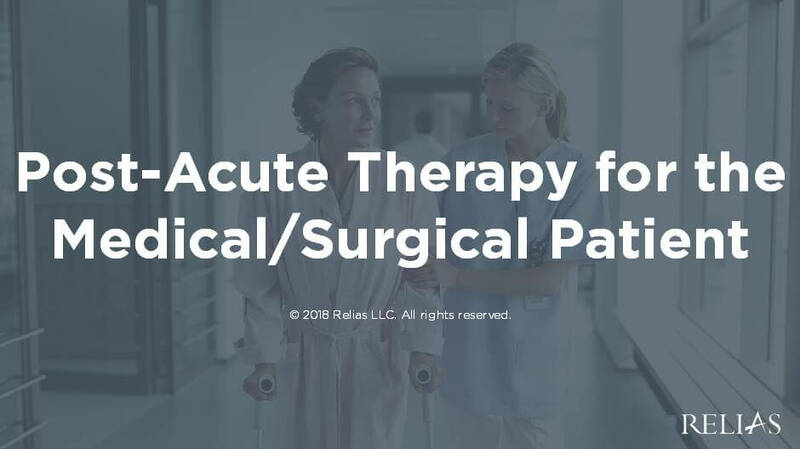 This course will illustrate factors that can impact the provision of therapy services in the general medical/surgical patient and how to address these factors in the treatment plan. This course is approved by the Ohio Physical Therapy Association, approval number 18S8222. This activity is approved for 1.00 contact hours. This course was approved by the New Jersey Board of Physical Therapy Examiners. Approval #: 1809‐45. This activity is approved for 1.00 contact hours. This course has been approved by the Alabama State Board of Occupational Therapy for 1.00 contact hours, approval number 20-676556. This course has been approved by the Florida Board of Occupational Therapy for 1.00 contact hours, approval number 20-676556. This course has been approved by the West Virginia Board of Physical Therapy, approval code REL-F19-06. Approval of this course does not necessarily imply that the WV Board of Physical Therapy supports the views of the presenter or sponsor. This activity is approved for 1.00 contact hours. Oklahoma Physical Therapy Advisory Committee has approved this course under Category B. Approval # 201912496. This activity is approved for 1.00 contact hours. Describe the effect hospitalization can have on a patient's functional abilities. Explain at least 3 factors associated with a hospital stay that can impact therapy services. Identify therapy strategies to address transition of care and discharge planning. Ann Elsasser-Root graduated from the University of Pittsburgh with a Doctor of Physical Therapy degree in 2013. She has experience in multiple care settings including skilled nursing facilities, independent living facilities, inpatient rehab, and outpatient orthopedic and neurology. Ann has a strong manual therapy background and has completed additional training in kinesiotaping, vestibular rehabilitation, and McKenzie MDT for the lumbar spine. She is most passionate about treating the older population to improve quality of life and maximize functional independence. Disclosure: Ann Elsasser-Root, PT DPT has declared that no conflict of interest, Relevant Financial Relationship or Relevant Non-Financial Relationship exists.